The world is now 90 years into a failed experiment. After World War 1 the rapid change from tried and true natural farming methods to the use of chemical fertilizers was not a throughly researched scientific advancement. The major explosives manufacturers, fearing an end to their vast war income, experimented with putting their products, nitrogen, potassium and allowed a world with an exploding population a way to feed the additional 2 billion souls arriving on the planet. It was solely about vast amounts of money and profits and it turned out to be an easy sell. As our farmers, and a growing percentage of the world's people are learning, this is not only an 'un-sustainable' system, stripping our soils of their capacity to sustain a healthy nation, it is killing us through damaged immune systems and a drug culture that only treats symptoms. It is a culture of farming that rewards the grower in ever bigger yields and not in the nutritional quality of the product. However, this is where we find ourselves at the dawn of a new century and a new millennium. We are in the midst of a disease plague, where some form of insidious disease such as cancer will now strike one out of every two of us at some stage during our lifetimes. Besides cancer, coronary artery disease, arthritis, diabetes and asthma* are just some of the degenerative diseases running rampant in modern society to degrees unimagined in prior generations. Science may have increased our life spans by a decade, but we are in ailing people for whom an ever-increasing armory of drugs is needed to manage our multiple disease symptoms. The vicious cycle of chemical dependency is mirrored in agriculture. Our nearly 90 year chemical experiment should have taught us one thing that relates to both human and soul health: chemicals and drugs, for the most part treat only symptoms. They very rarely offer cures, as they do not address the cause of the problem. Chemicals beget chemicals in both arenas; the more chemicals you pour on your crop to treat pest and disease, history has shown, the more chemicals you will need to retain control. Nutrition is the missing link in both situations. Poor nutrition is the cause of most human and animal disease and it is also the source of pest, weed and disease pressure in crops. 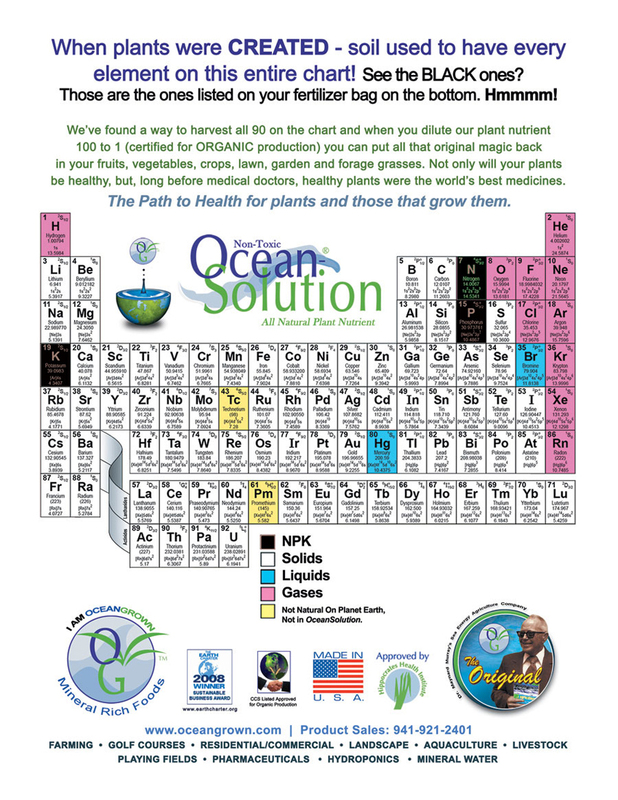 Every living cell (microbe, plant, animal or human) needs up to all 90 naturally-ocurring minerals from the periodic table for maximum efficiency. Our chemical Ag-Culture using high-leaching fertilizers, has allowed hundreds of years of harvesting and thousands of years of run-off to almost completely eliminate the mineral content from our soils. In a short period we have largely managed to destroy our soils, and, if civilization is to survive or control the current epidemic of modern diseases, these serious deficiencies are the most urgent problem we need to address now. * This short listing of current human disease has purposely not included what is probably the most serious afflicting our western civilization. This brief outline of a tremendous but easily overcome difficulty is the subject for another paper. The subject is about how dramatically this same mineral deficiency that affects our life systems also, and more intensely affects the human mind, the decreasing ability to think clearly, to distinguish good from evil, to discern the relationship of cause and consequence, etc. as revealed in the continuing decline of scholastic achievement and interpersonal and social behavior. Good health and happiness are obvious high-priority goals of human existence; the two are inextricably linked. If you have health problems you cannot have a feeling of well-being or happiness. Understanding the role of minerals in the health/happiness equation really requires thoughtful consideration of God's trinity of protons, neutrons and electrons, created out of nothing. Using these bits of original matter in various quantities and configurations, He created all that scientists have been able to learn, including the 92 elements of the periodic table with which He built all else. He also created all else that science has yet to discover. For life and blood of animals and humans, He created a special balanced blend of ALL the elements, a blend that is reflected nearly exactly only in chlorophyll and seawater. All the world's original soils were sufficiently rich in minerals to sustain plant, animal and human life without recorded disease for thousands of years! In regard to human health, there is an increasing awareness in the general community that things are not as they should be. While nearly everyone is concerned about their personal health, there is a growing acceptance that one's health is a personal responsibility that must be dealt with on a personal level. This was not true 50 years ago. Vitamin, mineral and nutritional supplements are the huge growth industry of the late nineteen-nineties and continuing to date. Recently, it was announced that, for the first time ever, a greater percentage of the Australian health dollar was spent on natural health and supplements than on conventional doctors and drugs. The medical community there is in an uproar- The medical community, world-wide, feels threatened by what they perceive as patients "self-prescribing" in the face of medical science. The link between soil health and human health is so poorly understood that the majority of the millions of consumers, who created a multi-BILLION dollar market taking vitamin and mineral supplements every day, have no idea of the real reason that they need this nutritional support. Often popular mythology and "health" writers recommend for symptoms with the same lack of foundational knowledge as doctors prescribing drugs. How would you have responded to the following multi-choice question prior to reading this article?